Caroline homecoming planned for September. Rimbey, AB) After speaking at public forums in Viking, and near Viking at Iron Creek Hall in the last week, Joe Anglin will be speaking on the Land Stewardship Act (Bill-36); the Land Assembly Act (Bill-19); and the Electric Statues Amendment Act (Bill-50) in Vegreville: Wednesday June 30th at 7pm. The meeting is located at the Dining Hall on the Vegreville Fair Grounds. On Monday Anglin made a short presentation to the Montana Band, and on Tuesday he was asked to attend a four band meeting, to answer questions pertaining to the Land Stewardship Act (Bill-36) and how it relates to the recently introduced Federal Bill S-11. Federal Bill S-11 delegates (denigrates) First Nations’ self determination (jurisdiction) over water, and assigns it to the provincial government’s jurisdiction. The Lavesta Area Group welcomes an opportunity to take the fight in defence of democratic rights and property rights directly into Mr. Stelmach’s own riding. Iran's Atomic Energy Agency Chief Ali Akbar Salehi says the country's first nuclear power plant will be inaugurated in the southern Iranian port city of Bushehr by late September. Speaking to ISNA on Wednesday, Iran's Atomic Energy Organization Chief Ali Akbar Salehi dismissed the UN Security Council's resolution against Tehran, saying it has no impact on the country's plans for the completion of its Bushehr power plant. "Issuing resolutions against Iran will not have any effect as we are determined to continue with our plans," Salehi said. The remarks come as in an earlier interview with ISNA, Salehi said that a total of 3,000 Russian nuclear experts were currently working on the power plant, adding that the final tests for the inauguration of the facility were being conducted with only a two-week delay. "God willing, the Bushehr power plant will be operational by the end of September," the top Iranian nuclear official stated. debkafile adds: The USS Ashland was the target of an al Qaeda Katyusha rocket attack in 2005 when it was docked in Jordan's Aqaba port next door to the Israeli port of Eilat. One of the rockets exploded in Eilat airport. The ship exited harbor in time to escape harm. These new arrivals are a massive injection of naval, air and marine muscle to the strength Washington has deployed in the Persian Gulf-Red Sea-Indian Ocean arena in recent months. The USS Harry S. Truman Carrier Strike Group consisting of twelve warships is cruising in the Arabian Sea opposite Chah Bahar, the Iranian Revolutionary Guards biggest naval base not far from the Iranian-Pakistan border. It is there that most of Iran's special commando units are housed. Meanwhile, the Germans in particular, with a more robust productive economy than the US at present, do not want to continue to issue IOUs against the future. They want to get things back into balance again, sooner rather than later. The British government is not far behind them. And our own Stephen Harper, in his aggrandized role as G20 host, is beating that drum as well. What none of these gentile folk mention is that a good portion of the public debt is private speculative debt dumped into the lap of taxpayers by colluding politicians beholden to private interests. That is especially true in the US and we have all seen what happened in Iceland, whose shores have been vacated by the perpetrators of massive fraud against depositors from Holland and Britain. The 300,000 or so Icelanders are now being asked to pick up the bill while their banksters enjoy martinis and cook up the next scheme somewhere in the Bahamas. Where is all this taking us on our bumpy ride into the future? Well, if you keep printing IOUs like the Americans advocate for, those IOU’s are going to be worth less and less as their numbers grow because the products and services they are supposed to represent do not exist. And the reason for this is that the IOUs are used for speculative purposes, more so than being used to stimulate growth in products and services available. They call it the “quick buck syndrome” or “gambling spirit” prevalent among drug dealers, for example. The Europeans on the other hand, with Stephen Harper harping along, want to slash and burn, cutting public sector spending. The classical conservative mantra is that less taxes on the private sector will stimulate spending in that sector leading to increases in productive enterprise. The trouble is, credit available to the private sector has dried up because money has been diverted into the speculative economy by its owners who are keeping it there, hoping to make quick gains. The underlying problem is tunnel vision with “me” in the center of the tunnel. Recipients of proceeds from 2010 Nevada ticket sales at the Legion were: Rocky Search and Rescue (represented by Jayne Larsen), Rocky Clearwater Family Wellness (Jennifer Porter), Wheels of Time Museum (Verna Smith), Church of the Nazarene (Karen Ostler). The cheques were presented by Pirkko Van Dijk from the Legion. After some 18 months of planning the shovels went into the ground in the field behind Caroline School on Thursday, June 17. The formal beginning of the work was made by volunteers Bruce Johnson (black hat) and Jim Bystrom (white hat). Also in attendance: Caroline School Principal Nathan Moore, Village Councillor Bob Pryor and Wild Rose Public Schools Superintendent Brian Celli. Nathan Moore said that a football field will be created with provisions for other sports such as soccer and a track around the field. Most of the materials and labor will be donated by individuals and organizations to an approximate value of $100,000 by the time the job is done. Coach Jim Bystrom said that the first football game on the new field is scheduled for September 10. Two days after the shovels went into the ground behind Caroline School to create a new sports field, the topsoil had already been removed, to be replaced by a layer of sand, upon which the new sod will be established by replacing the topsoil and seeding a mixture of annual rye and grass. The field will be tilted slightly to the east to facilitate drainage into a drainage tile system. There is still a need for red shale to be used on the running track around the field. Owner Ian Willigar is in the process of expanding his services to local owners of vehicles, engines large and small, and farm equipment. The store is located on the east end of Caroline, right on the highway. The Ryan Jorgensen Memorial Skateboard Park has new equipment and is there for skateboard enthusiasts. It is right next to the complex with lots of parking and exposure to people who frequent this much used area in the Village of Caroline. Seen in the background: A bulldozer in the process of removing topsoil from, and leveling the sports field behind Caroline School. Here in Canada we celebrate National Aboriginal Day on June 21. It coincides with the Summer Solstice which is celebrated across the world. When I say “we” celebrate, a qualification should be made. For the vast majority of Canada’s population the natives of this land do not even register on the radar other than as an occasional news item in the main stream media. And that usually happens when something goes wrong, as is the case with most cultural minorities. National Aboriginal Day is usually celebrated by a show of native culture in individual communities, where local natives put on their traditional festive garbs, display arts and crafts and perform traditional dances. It is an attempt to reach out to the mainstream culture and say: “We are here!”. Canada is a cultural melting pot and early settlement meant the meeting of male travelers/traders/settlers with native groups resulting in the emergence of the Metis culture, because of the lack of acceptance by either the European or Native culture of the progeny of this mixing of people. Because of friction between these groups over time, the result here in Alberta was the establishment of designated areas, or reserves, where the various groups had exclusive use of the land. Looking at a map of Alberta, one will see a landscape dotted with “Indian” and “Metis” settlements, most of which are in the north of the province. Some one hundred years ago, unnamed “bright sparks” in the western academic community decided to solve the problem of integrating native people into the mainstream culture. Based on prevailing psychological theories of the day, they came to the conclusion that if you started with a clean slate, you could turn aboriginal children into little Europeans by removing them from their parents and raise them in residential schools where any reference to their traditional culture would be strictly forbidden, including the use of their own language amongst themselves. From academia, this idea found its way into government circles, was turned into policy, and handed over to the various church organizations to implement with a nice packet of dollars attached. We now know what the sorry result of this futile attempt at cultural genocide is. A Truth and Reconciliation Commission into that catastrophe is currently conducting hearings across the land in order to try and mend fences. The problem is, most people don’t even know that there is a fence to mend and feel in no way responsible for what happened. The very existence of the commission is ignored. So, what hope is there for Canada’s aboriginal people? Let me tell you, they are very patient people and their numbers are increasing. Ours are not. Go figure out the math. The Caroline Complex hall was filled with young athletes, their parents and supporters, and Caroline School athletics instructors on June 7 for the annual Athletics Awards ceremony. The last few years has seen a positive change in the culture at Caroline School and it has a lot to do with the recognition by school authorities that the people of the Caroline area value sports highly. The result has been a very high participation rate of students in competitive sports and the great bonus has been greater academic achievements by highly motivated students. Parent volunteers, school staff and management have all worked together to achieve this change which is now putting Caroline students at the leading edge in many sports competitions. Junior High Track, Senior High Track. Katelyn Godwin (CA). Senior Girls Volleyball: Morgan Smith and Kailey Fauville (shared MVP award), Sara Stevens (MIP), Danika Foesier (CA). Senior Boys Volleyball: Maverick Cardinal (MVP), Nico Gelderblom (MIP), Brett Godwin (CA). Curling: Morgan Smith (MVP), Shayna Ververda (MIP), Chelsea Ververda (CA). Junior B Girls Basketball: Paige Leek (MVP), Jenna Godwin (MIP), Cheyanne Larsen (CA). Junior B2 Boys Basketball: Jonathan Carr (MVP), Teigan Bossert (MIP). Junior B1 Boys Basketball: Calan Graham (MVP), Cole Crossman (MIP), Chetwyn Westergaard (CA). Junior A Girls Basketball: Cassidy Piesse (MVP), Anna Denham (MIP), Lindsay Mandelin (CA). Junior A Boys Basketball: Cole Cummins (MVP), Nathan Jameson (MIP), Dalton Slager (CA). Senior Girls Basketball: Dayle Stelter (MVP), Rianna Follis and Shayna Ververda (shared MIP), Sara Stevens (CA). Senior Boys Basketball: Maverick Cardinal (MVP), Nico Gelderblom (MIP). Senior High Badminton: Kailey Fauville and Morgan Spooner (shared MVP), Siera Michalsky and Leonard McTaggart (shared MIP), Taja Graham (CA). Junior High Badminton: Taylor Michalsky (MVP). Junior High Track: Scott Johnson, Paige Leek and Mathew Wesolowsky (shared MVP), Mallory Westergaard and Caresse Harvey (shared MIP). Roy Trimble and Chetwynn Westergaard (shared CA). Senior High Track: Kailey Fauville (MVP), Sara Stevens (MIP), Dion Roper (CA). Junior High Female Athlete of the Year: Taylor Michalsky. 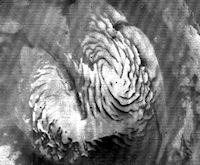 June 16, 2010: Almost 40 years ago, NASA's Mariner 9 spacecraft relayed to Earth the first video images of Mars' northern polar ice cap, revealing a strange pattern of spiral swirls that has puzzled scientists ever since. Using new data from the Mars Reconnaissance Orbiter (MRO), researchers have finally uncovered the secrets of the troughs that snake through the ice cap like a spiraled maze. When capital goes on strike why is there no outcry? The wording of the motion caught my attention, because it only focused on the labour code. This is not unusual because typically conservative ideology and specifically the extreme right-wing element of the ideologists are generally less than supportive of union activities or labour unions in general. However, I found it fascinating because the motion could have said “No child’s right to an education will be denied by reason of lack of funding”, or “a child’s right to an education will be protected by the Alberta Bill of Rights.” I personally prefer the wording of the latter because it actually elevates the rhetoric of a “child’s right” into an actual protected right both labour and capital would be required to respect! Observing the balance of labour with capital in a society that professes allegiance to free market principles is in many ways a study in irony. There seems to be a prevailing pattern that the more a person professes to the ideology that the market reigns supreme in all matters, the more anti-labour [union] they tend to be. The irony, in very simplistic terms, is baffling. A labour union is technically a democracy that pools individual labour resources together to maximize the benefits for its members. In contrast a corporation is technically a democracy that pools individual capital resources together to maximize the benefit for each investor. In a union each member has a vote. In corporation each share represents a vote. There are many other similarities [and differences] contrasting unions to corporations as an institution, too many to list here. The question I ponder is why is labour [labour unions] generally criticised or vilified when there is a strike [withholding labour], and there is rarely any criticism levelled at a corporation if they withhold or withdraw [strike] capital? For example: most recently Alberta’s government was faced with the threat of a capital strike when it attempted to raise royalty rates. There was no criticism levelled at the corporations threatening to leave Alberta for better drilling privileges in Saskatchewan. This was generally accepted as an unquestionable market right to withhold capital. The irony is the capital strike threatened, had a far greater potential negative impact on Alberta’s economy as a whole, than any teacher’s strike could possibly achieve. There was no outcry or threat of adopting policies to ensure that an individual right to sell their labour was denied by a capital strike. The fact is drillers wanted to drill, and the government wanted the resources extracted. How is it that a company that withholds investing capital for a better return is viewed as somehow different than a teacher who withholds labour for a better return? For the record, I am in favour of identifying essential services such as the ones that doctors, nurses and teachers’ provide. I just do not adhere to the prescribed doctrine that only labour should be held responsible for the delivering the service. There is a balance to managing essential services. Labour without capital [funding], and vice-a-versa, is powerless to deliver the service. If the balance has to be struck in practical terms, then it should be struck in terms of policy. The Wildrose faithful would be wise to question the words they chose in adopting policies, if they truly want to represent the middle political spectrum of the province. It is all about balance. The eyes of most people glaze over when the word “economics” appears before them. Intuitively, “economics” belongs in the world of eggheads and the like. Economists are people who construct elaborate theories based on countless charts, graphs and tables. And their one claim to fame is that history usually proves them wrong. Economists have a lot to learn from the Greek Oracle of Delphi, to whom budding warlords came to find out about the fates of their adventures: The message was likely that someone would win and someone would loose (read my lips). And since the looser was very unlikely to lodge a complaint against fees charged, due to capitation, being an oracle was a relatively safe occupation. highly paid economists from the London School of Economics answered. “Sorry ma’am, we didn’t”, like a bunch of school boys (which is exactly what they are and don’t mind admitting it). In a way, economists and politicians ride in the same chariot together: They are the object of public scorn and head shaking and so successfully divert the public mind from the real underlying issues of the day. And in economics there are some very real issues ahead that we will collectively have to face, like it or not. The fabled economic recovery is just not happening. The economic engine is spluttering, running out of monetary stimulus fuel injected by our governments who have borrowed privately created money at interest for the purpose. So now the budget deficits are rising rapidly, bringing forth the slash and burn mentality, once again. Economists, living in their familiar fairy land of rising graphs look, as always, for positive signs and talk them up when they see them. The stock and money market speculators follow suit and up go the numbers. Until the next panic, that is. And so it goes. Greed and fear, bull versus bear. A life in a primitive land of craving and suffering. Some would call it the world of the animal. Does it have to be that way? Not for a minute. Contrary to popular belief our financial system is not some kind of natural phenomenon like the weather. It is designed and maintained by humans who have a vested interest in making us believe that it is, indeed, something out of reach to change. Then these same people can continue to benefit from the wild oscillations of the system at our expense while our egghead economists fail to predict the next crisis. Come to think of it, chickens have their origins in eggs. They are also herd animals with no claim to intellectual brilliance. Perhaps the term “egghead” has something going for it? This water fountain, in Little Green Park in Caroline, was donated to the people of Caroline by the Graduating Class of 2009. The official dedication to place on Wednesday, June 2. Vice Principal Pam Wright (on right) was present on behalf of the Class of 2009. Mayor Laura Cudmore (left) presented a certificate of gratitude on behalf of the Caroline community. Others attending: Councillor Bob Pryor, Village CAO Tyler McKinnon and School Trustee Gary Thompson. These ladies of the Royal Purple hosted a Strawberry Tea for Caroline's seniors at the Seniors' Drop In Center on Wednesday, June 2. It was all part of Seniors' Week activities. In the kitchen: Leona Staben, Sharon Veinot, Leslie Detta, Fay Derksen, Val Staben, Millie Nanninga. Mentors, mentees and parents gathered for the annual celebration of this program in Caroline School on Friday, June 4. Adults from the surrounding community spend one hour a week with an elementary student in a pre-arranged matching program to build an ongoing relationship that lasts all year. Sometimes the same match continues over several years. The program is run under the umbrella of Big Brothers Big Sisters of Innisfail and is supervised locally by Leslie Cooper-Shand who can be contacted by prospective mentors on 403-507-8444. The In School mentor program is run in schools across North America and has demonstrated positive outcome for participants, young and old. These up and coming bikers learned the ropes from RCMP Constable Conrad Siewert on Saturday, June 5 in the curling lounge at the Caroline complex. It was part of a biking safety program run by Alberta Health Services under the leadership of Olivia Blum. Several local organizations provided snacks and volunteers for the event. of the skill tests at the biker rally. Front: Orest Luchka (Secretary), Ron Wickins (Incoming President), Nazem Kamaleddine (Past President). Back: Amy Wickins (2nd. Vice President), Alvin Toovey (Director), Bob Penner (Tail Twister), Ted Webster (Installer and Past District Governor from Innisfail) Debbie Rahn (Lion Tamer). Not present: Greg Somers (1st. Vice President), Al Marchant (Treasurer). John Reid (Director), Jim Kline (Director). Cancer Fund Raising, CNIB, Caroline Karate Club, Caroline AA Group. The Caroline LIONS Club thank everyone for assisting and supporting us..
or phone 403 -722 3870 LION secretary Orest. The Caroline complex hall was packed with enthusiasts of the sound of the steel guitar on Sunday, June 6. A program lasting well into the evening was opened by organizer Jeff Bradshaw (left) and his support group which included Roy James on guitar and vocalist Sheryl Skaalerud. All kinds of country music related merchandise was on offer at the show, courtesy of The Music Shop on Main Street in Rocky Mountain House. Is there a Global War Between Financial Theocracy and Democracy? By Les Leopold, Author of "The Looting of America"
This article pretty well sums up what has happened to us all. A wake up call. Commentary: Crash-predicting letter says recovery might not come until 2028. On Wednesday, June 9, the latest draft of the Clearwater County Municipal Development Plan will be presented to the public for comments at a meeting to be held at the Walking Eagle Motor Inn in Rocky Mountain House at 7pm, for those that would like to attend. This plan has been a long time coming and has been scrutinized at a number of public consultation meetings, where municipal subdivision policies have received most of the attention. Some of the debate has been acrimonious because of the perception that some people have been favored over others in their ability to subdivide property for financial gain. There is also another aspect to the subdivision phenomenon that stirs some rather strong emotions: The mixing of country and city cultures and values. Traditionally, these cultures have evolved separately over the years since Europeans flooded onto the North American continent. Cities have become progressively cleaner and neater over the years, on average, by way of a process fueled by neighbours trying outdo each other in neatness and tidiness. While this has also been the case for farmsteads, it is not necessarily true for farming operations which are, by nature, both smelly and noisy. And now, a highly efficient communication system with paved roads and fast fuel efficient vehicles has enabled city folk to move into the country and commute to work or spend weekends at their country properties while planning to retire on same. The same road network has also enabled city folk with all manner of recreational vehicles and questionable attitudes towards land stewardship to easily travel into the backcountry to blow off steam to relieve themselves of city frustrations. Add it all up and you end up with a clash of cultures. Another ingredient is added to the mix: The Clearwater County policy of allowing the owner of a quarter section (160 acres+,-) to take a 5 acre +,- “first parcel out”, at a current value of about $150,000. The proceeds from the sale of such a parcel becomes an important part of a retirement fund for some rural people. It has the potential of bringing “country” and “city” into closer contact, contributing to a cultural clash. Rural people are also getting upset about their increasing dependence upon government subsidies, with all their attached bureaucratic rules and conditions. Add it all up and you have a potent brew, a taste of which may be expected at the public meeting in Rocky. A homecoming celebration is planned for the Heritage weekend on September 10/11/12 this year with events at the Legion. This event is hosted by the Homecoming Committee every 5 years in Caroline and will include an interfaith church service and a homecoming concert. Please give your relatives and friends a “heads up” about this event. More details to follow over the summer. Twenty nine students are about to graduate from Caroline School at the end of June. And several of them are going on to post secondary studies. That fact stood out at the graduating ceremonies held at the school on Friday, May 28. The class also presented a $2,000 donation to the community in the form of a cheque to the Rec and Ag Society. This is carrying out a recently started tradition in Caroline where the graduating class of 2009 donated a water fountain for Little Green Park which will be formally unveiled on June 2 at 11:30 am. MC for the ceremonies was Vice Principal Dean Pilipchuk who introduced dignitaries from the school division and local and provincial governments. In the principal’s address to the graduates, Nathan Moore spoke about the difference between “being right” and “doing right”. He stressed the importance of belonging to the latter category. The Class of 2010 valedictorians were Kailey Fauville and Allan Liang. audience of family, friends and admirers. Meghann has been dancing for 15 years and is going on to the University of Calgary to study dance. Ballet by Katy Johnson, Shyla Schmaltzbauer, Brittany Willsie and Erin Willsie. A large coronal hole is easy to spot in this image of the Sun from SDO's AIA instrument. In the extreme UV wavelength of 193 Angstroms, the dark coronal hole extends from the top of the Sun to almost halfway down (May 27, 2010). Coronal holes are magnetically open areas from which high-speed solar wind streams out into space. 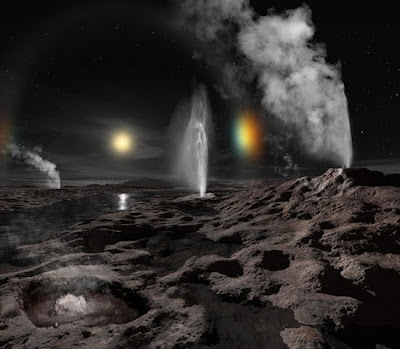 They appear darker in this wavelength because there is just less of the material that is being imaged, in this case ionized iron. 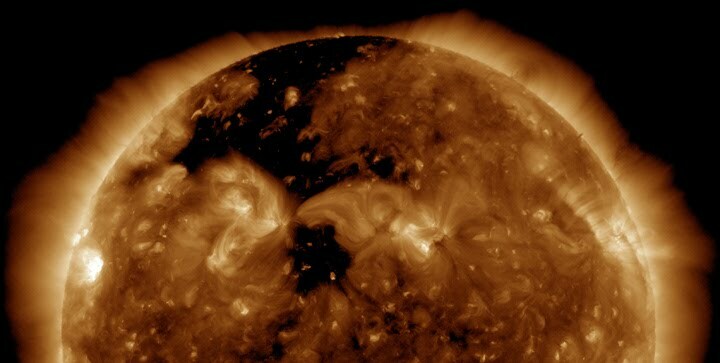 This is one of the most substantial coronal hole areas spotted on the Sun in many months. We're falling into a double-dip recession. The Labor Department reports this morning that the private sector added a measly 41,000 net new jobs in May. But at least 100,000 new jobs are needed every month just to keep up with population growth. In other words, the labor market continues to deteriorate. The average length of unemployment continues to rise -- now up to 34.4 weeks (up from 33 weeks in April). That's another record. The Solar Dynamics Observatory (SDO) was launched just late last year and is now providing telemetry which is some 10 times more detailed than anything previously available. Watch this video to get a sense of the power of His Majesty. Remember, Earth is about the size of your finger nail as compared to what you see on the screen. Eerie parallels between current and previous major bear markets.